The ILF supports decision makers in the economic sector, administration and politics with practice-oriented research results at the interface of tourism, landscape development and nature conservation. One focus is on the new parks of national importance. ILF offers a methodological toolkit for the development of tourism offers and product design of nature-based tourism as well as guidance and strategies for landscape-oriented recreation. Recreation is becoming increasingly important in our continuously urbanized society. The population of densely populated urban and periurban areas is dependent on the presence of attractive nature-based landscapes and open spaces. This is important not least for the well-being and health of the population. The inclusion of the needs of the population is a key aspect in planning and design of recreation areas. Thus, motives and desires of recreation seekers with respect to health, exercise, nature experience and relaxation play a big role. Another important aspect is the prevention of user conflicts with recreation seekers in environmentally sensitive areas. Against this background, the aim of this project is a contribution to a better understanding of recreation seekers’ needs. The results are processed as a best practice guideline, in order to support landscape planners for a customized planning and design of recreational areas. 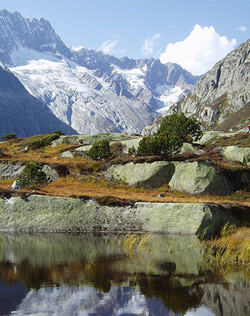 Nature-based tourism in its many facets and forms builds an important element of an ecologically-sustainable development in the Alpine space. Nature-based tourism encompasses a responsible stay in natural areas and cultural landscapes, and its organization and implementation developed from the regional needs of the participants. At the same time, environmental, social, cultural and economic conditions must be respected and sustainably protected, promoted and financed. In nature-based tourism, visitors should be able to experience nature and culture, and be sensitized for the needs of the environment actively and with all their senses. The demand for nature-based tourism in the Alpine countries is considerable and is increasing in the course of general and tourism trends. However, nature-based tourism, if not applied in a nature-friendly way, can also bring new threats and risks to sensitive natural areas in the Alps. In Switzerland, a close relationship between tourism and biodiversity exists. On one hand, tourism benefits from the diversity of nature and landscapes. On the other hand, tourism with its activities and infrastructures is as well responsible for threathening biodiversity in Switzerland today. This aspect should be taken into account in the Action Plan of the Biodiversity Strategy Switzerland, which is currently in progress. In a research project funded by the Federal Office for the Environment, the Institute for Landscape and Open Space of the University of Applied Sciences Rapperswil examined ways of how the sustainable use of biodiversity can be secured in the long term in Switzerland. The focus of the project "Financing of biodiversity through tourism in Switzerland" is on which role and contribution tourism can offer regarding the financing of biodiversity or which instruments could be applied. Alle Projekte "Naturnaher Tourismus & Pärke"